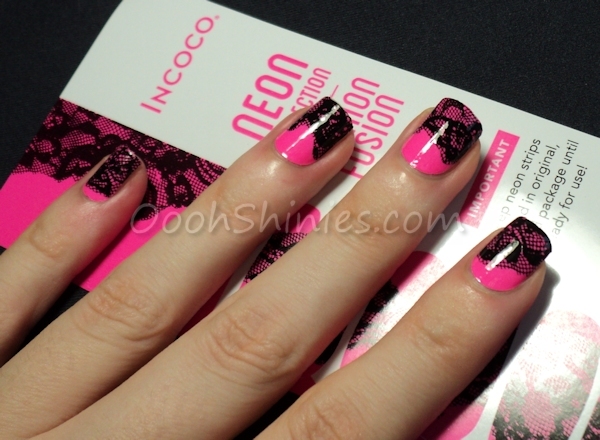 The set I'm showing here is called Fashion Fusion, neon pink with black lace. Here's what I received, 3 sets (I'll be showing the other 2 in my next 2 posts, especially the glitters wowed me! ), a little nail file and orangewood stick, and a folder with info and a bunch of their shades. And they have a LOT of different strips, way more than shown on that folder. From normal polish to glitter to nail art, but also French designs and pedicure designs! 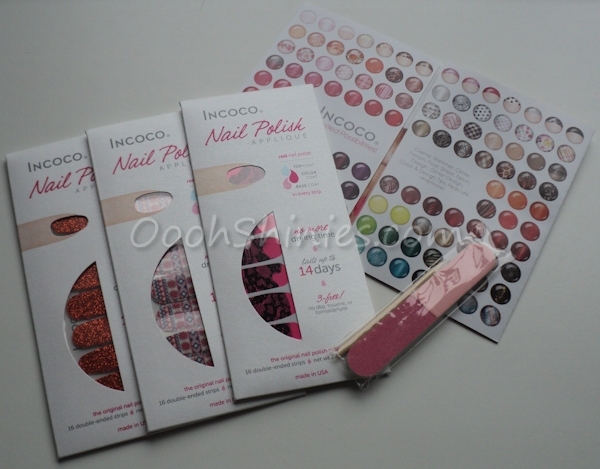 Incoco has a clear vid on their site about how to apply these, but you can already see from the sealed package that these ain't your average nail strips. They're actual polish strips, instead of the usual stickers. And if you have any doubts, opening the package and smelling them will convince you, hah! They also included base and top coat in them, I didn't finish this mani with top coat either. 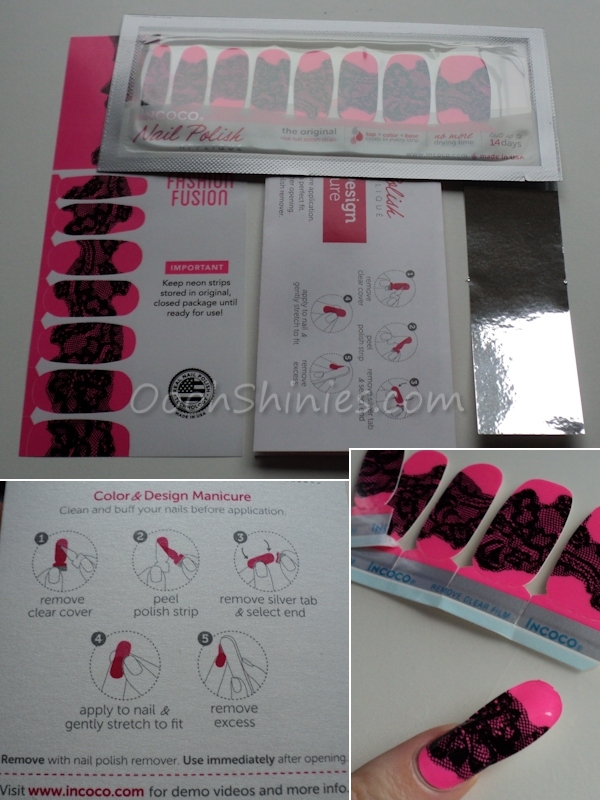 The package also comes with a big silver sticker which I used to reseal the little bag that holds the strips. It's to prevent them from drying out, but even if they would dry out a little, I bet they still work then by using them as a decal as I showed here. The strips come in plenty different sizes (16 strips in total), ánd both the top and bottom part of each strip can be used near your cuticles, depending on the shape that works best for you. I haven't seen that before with strips, but I like it! After applying them, you give them a gentle stretch and rub them, and somehow they end up smooth and even on every single nail, no bubbles, no wrinkles, nothing like that! And as you can see, they're long enough to fit even on very long nails (I even kept my nails long for the reviews of these, lol). I think I could easily get 2 nails done with 1 strip if I'm careful. However, the little file that came along didn't work as nicely for me, as you can see on my tips, it felt a bit too coarse/smooth for me, and for the next sets I went with a different file to get a better result at my tips.